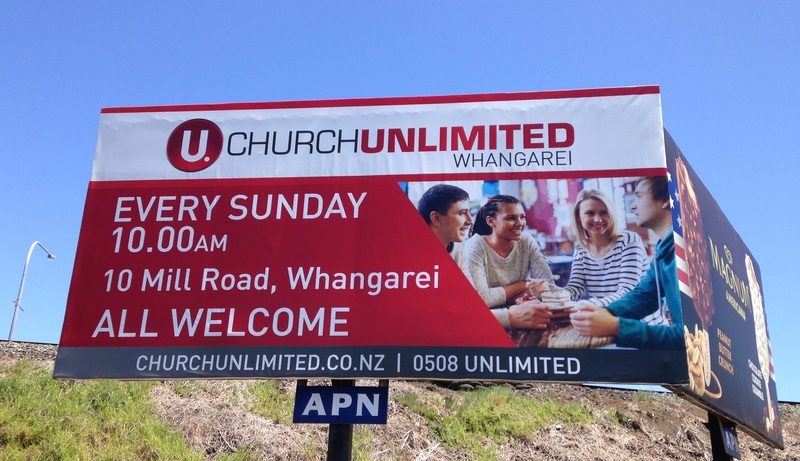 Last weekend saw the launch of Church Unlimited in Whangarei, with billboards popping up around town in anticipation. From what I can tell this is the second church in the city this year which has rebranded as it partners up (or comes under the wing of) a larger church. First Kamo Alive became Arise Whangarei in February (also complete with a glitzy billboard advertising campaign), now Crossroads has become Church Unlimited Whangarei. This trend of smaller churches becoming regional outposts of larger metropolitan churches seems to be becoming more commonplace in New Zealand, particularly within the Pentecostal ‘megachurches’ (well, comparatively mega for New Zealand). It’s like church franchising in a way, as you’d see with McDonalds or Subway, except in this case they’re selling God and community. Often, from the outside looking in, it appears the church brand and/or the lead pastor, is at the forefront in marketing the church franchise to the wider populace – from what I can gather with Arise at least, it seems to be a very top heavy approach, with their lead pastor regularly visiting (or beaming in from Wellington on the big screen). I can’t help but wonder if it’s merely an attempt to cater to the consumeristic culture of the world around us. We want church to be cool. We want it to be flashy and big. All of the advertising and marketing points towards an amazing experience which you can turn up each week to receive. These approaches to church makes me uncomfortable. Perhaps it just disturbs my Baptist sensibilities and thoughts around the autonomy of the local church (which links back to the priesthood of all believers). Perhaps it the growing consumerism seeping into the church. I’m not sure exactly. Ultimately I realise that churches are never going to be one size fits all. It’s near impossible to have a church which caters to every person (as awesome/messy as that would be). If the Arises and Church Unlimiteds of the world are reaching members of the city who would not otherwise be reached, and creating places of community where people are actively challenged and encouraged to grow as disciples, then that’s great. But for me, I like my church to be a bit rougher around the edges, where everyone is encouraged to get involved, even if that means the church sacrifices some of its polish from a worldly perspective.